Verified Supplier - Jining Ychuang Construction Machinery Co., Ltd. Verified Supplier - Xuzhou Heavy Construction Machinery Co., Ltd. Verified Supplier - Henan Grande Machinery Equipment Co., Ltd. Verified Supplier - Xuzhou HCN Machinery Technology Co., Ltd. Verified Supplier - Linyi Vision Construction Machinery Co., Ltd. Verified Supplier - Xuzhou Shangheng Engineering Machinery Co., Ltd. Verified Supplier - Henan Minzhipu Electronic Commerce Co., Ltd. Verified Supplier - Laizhou Ruihao Machinery Co., Ltd. Verified Supplier - Guangzhou Sanse Mechanical Equipment Co., Ltd. Verified Supplier - Wenzhou Saibo Auto Parts Co., Ltd. Verified Supplier - Longyan Ealita Machine Manufacture Co., Ltd. Verified Supplier - Xuzhou Bob-Lift Construction Machinery Co., Ltd. Verified Supplier - Taian Hi-Tech Sunrise Machinery Co., Ltd. Verified Supplier - Shandong Mingde Gangcheng Machinery Co., Ltd. Verified Supplier - Chaoyang Kailong Engineering Machinery Co., Ltd. Verified Supplier - Yantai Rima Machinery Co., Ltd.
Want product and industry knowledge for "loader buc..." ? 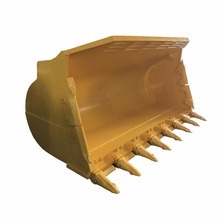 Do you want to show loader bucket or other products of your own company? Display your Products FREE now!